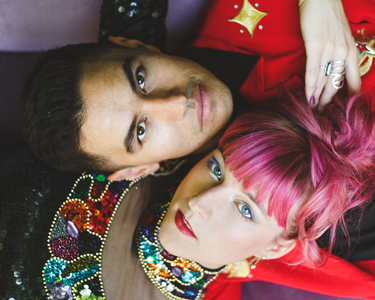 KiSMiT is a sassy and vibrant pop duo based out of Silverlake, CA. With a diverse song set and infectious energy on stage, they are making waves in the LA music scene. Lead by the soaring vocals of Carly Barnette paired with the sweet electric soul of Sebastian Reunert, their love for each other and their music shines through in every number. KiSMiT draws their inspiration from the millennial funk of Allen Stone, to the rich sonic landscapes of Kimbra, and the honest storytelling of Sara Bareilles. Their mutual love of funk, pop & songwriting blends their voices together in such a way that only fate would have it. Los Angeles, CA – Pop duo KiSMiT has released their newest song “Look No Further.” The velvety single explores what it means to find everything you need wrapped up in one individual--to find yourself emotionally and physically satiated. Fusing elements of R&B, jazz and funk with a pop melody, the track serves as a perfect introduction to the incomparable duo. “Look No Further” is now available on digital platforms. Mixed by Jorel Corpus, mastered by Jett Galindo, and written by both Carly Barnette (vocals) and Baz King (vocals, guitar and production), the track features heavy drums paired with effortless vocals to build a sensual and enigmatic atmosphere that KiSMiT relishes in. “‘Look No Further’ is about trusting that there is an infinite well of love within one relationship,” explains Barnette. KiSMiT brought in friends, Moez Dawad (drums), Drew ofthe Drew (bass), and Balam Garcia (guitar) for an extra advantage in defining their musical outlook. KiSMiT is made up of Carly Barnette and Baz King who connected while taking a songwriting class at Berklee College of Music during their senior year. The feisty and full of life Barnette has always found music to be a constructive and emotional outlet, while the more laid-back King recognizes music to be a medicinal power. With similar outlooks on music, the two are a perfect fit to create remarkable compositions. When not focusing on KiSMiT, King works on other artistic projects through his own production studio, Baz King Productions, while Barnette focuses on arts activism with her organization ALLIN Los Angeles. The organization, which she co-founded, focuses on artistically curating events dedicated to community outreach. Journeying together emotionally and sonically, KiSMiT designs their music to carry powerful energy that corresponds to healing and the manifestation of dreams. The duo’s music has been lauded by publications including PopDust, IMPOSE, and Celebmix. The latter describes their music as, “flair and creativity whilst empowering amazing vocals and unstoppable lyrics.” Keep tabs on KiSMiT as they continue to release new music throughout the year and join the positivity radiating from KiSMiT by checking out their website, KiSMiTMusic.com. “Look No Further” is now available to stream and download worldwide.